13.05.2015 New 3 Track EP out 31st July! We are pleased to announce our new 3 track EP will be released on the 31st July…available on limited edition 12″ vinyl and digital. The UK’s premier funkateers release their long awaited third album “What Comes To Mind” in September 2015 with a three track 12” EP coming out in July as an album taster……aptly titled “Return Of The Haggis EP” – hot funk, soul and boogie for the summertime! 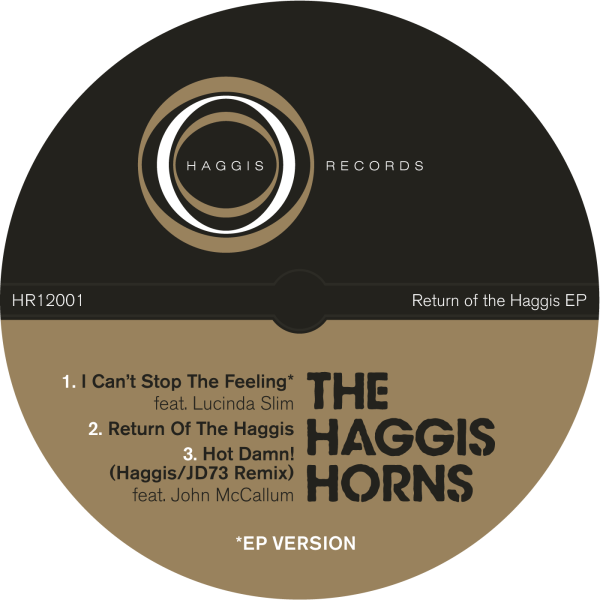 Leeds based The Haggis Horns first hit the music scene in 1999 as both a band and horn section, the Horns making their first recorded appearance on The New Mastersounds debut album that year. Featuring some of the finest brass and rhythm section players in the UK, The Haggis Horns musicians have played live and recorded with a host of major music artists including Mark Ronson, Jamiroquai, John Legend, Amy Winehouse, Corinne Bailey Rae, Lou Donaldson, Martha Reeves, The Cinematic Orchestra, Morcheeba, Roots Manuva, Lily Allen, Finley Quaye and Nightmares On Wax. With two album releases on UK independent label First Word Records (“Hot Damn!” in 2007 and “Keep On Movin’” in 2010), plus five singles and hundreds of live gigs worldwide, they’ve built a global following that unites soul boys, jazz brothers, funk sisters and break dancers in their love of Haggis Horns music. Now in autumn 2015, their third album “What Comes To Mind” is getting a release on their own Haggis Records. As a little teaser they’re putting out an EP for summer featuring two new tracks from the album plus a previously unreleased remix of a Haggis Horns classic. “I Can’t Stop The Feeling” is the A-side and features singer Lucinda Slim, who featured on the band’s second album and gigs regularly with the band. The B-side is “Return Of The Haggis”, a typical party funk instrumental the band are known for and a favourite in their live shows. Both tracks have that classic mid-70s feelgood funk-soul-boogie vibe reminiscent of early Kool & The Gang, The Blackbyrds and the Average White Band. The final track on the EP is a previously unreleased remix of their first single “Hot Damn!”. Once again featuring the powerful vocals of singer John McCallum, this version adds some boogie/disco spice to the original’s hard funk flavour.